Asked who the first Portsmouth player I could remember was, I paused for a while given that for the first decade and more I was watching football they were in a division lower than Burnley. My first Burnley v Portsmouth games were in the early 70s in Division Two and I can remember the 1972/73 game clearly for two reasons. Firstly we won the game 4-0 with all the goals coming in the first half, and secondly for the welcome the visiting captain got on the night. By then aged 36, Ray Pointer led out Portsmouth in what was to be his last appearance at Turf Moor, a ground he'd graced over a seven year period when he became our club's post war record goalscorer, a record that still stands proudly to this day. The blonde bombshell was a real hero of the team of the late 1950s and early 1960s, a massive crowd favourite, and he would certainly be so today with his all action style not giving a minute's rest to opposing defenders. Burnley were Pointer's first professional club, but he didn't arrive straight from school and was past his 18th birthday before he signed for the club. He played his football for such as Cramlington Welfare and Dudley Welfare and was spotted by Burnley scout Charlie Ferguson. He'd already had trials with Blackpool but manager Alan Brown was quick to snap him up for Burnley after a trial in 1955, initially signing him on amateur forms before eventually signing him on full professional terms in 1957. By October 1957, just before his 21st he made his first team debut at Luton. He didn't score in that game but didn't have to wait too long to get on the scoresheet for the first time. That came just a week later when he got the fourth in a 6-0 hammering of Sunderland. He got eight goals that season but in the following season he scored an incredible 27 goals in 37 league appearances and that led to a call up for his country. He was selected to play for the under-23s against Italy at the end of that season in a game to be played at the San Siro in Milan. The English run out convincing 3-0 winners and Pointer's international career had started in some style with two of the three goals. He might never have beaten that 27 goal total but the 1959/60 season saw him win a Football League Championship medal with the Clarets finishing with another 19 league goals. Pointer by now was considered to be one of the best centre forwards in England. He'd played five times for the under-23s but finally, and long overdue, he won his first full cap in September 1961 against Luxembourg. He scored in a 4-1 win at Highbury and a month later made two more appearances. The first was at Ninian Park against Wales in a Home International and then a few days later he was in the side that beat Portugal 2-0 at Wembley to ensure England qualified for the 1962 World Cup in Chile. The two goals that night were both Burnley goals, from Pointer himself and the other from John Connelly. He looked destined for a summer in Chile but incredibly he was left out with Alan Peacock (Middlesbrough) and Gerry Hitchens (Inter Milan) making the squad. Indeed he was never capped again for his country after two goals in three games. It certainly didn't affect his club form and in the next season he hit another 25 league goals as Burnley came so close to winning the double, coming second in the league before losing the FA Cup Final to Spurs. One of those goals, an equaliser against Wolves in April, was his 100th league goal for Burnley. He was the second Burnley player to reach that milestone during the 1961/62 season with Jimmy McIlroy and they joined George Beel, Bert Freeman and Louis Page as the only Burnley players to have scored 100 league goals or more. Since then just Andy Lochhead has been added to the list. 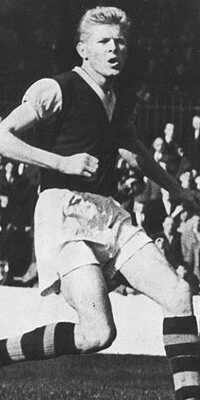 The 1962/63 season saw him eventually move to inside right to accommodate the young Lochhead and in April that season he suffered a chipped bone in his ankle that was to, in effect, end his Burnley career. He never really regained full fitness and with Lochhead and also Willie Irvine coming into the reckoning most of his football was played at reserve team level. His last, and 118th league goal for Burnley (he scored 133 including cup goals) came in September 1964 against West Ham and two months later he made his final appearance in the first team bringing to an end what could only be described as a brilliant career at Turf Moor. He left the club in August 1965 for Bury. He was only at Gigg Lane until Christmas and scored no less than 17 goals in 19 games for the Shakers. Jimmy Hill signed him for Coventry and he added another 11 for them to take his total to 28 league goals for the season, his best ever. With a promotion on the cards for Coventry in 1967 he made his last move, signing for Portsmouth and he went on to play 149 league games for them. By then his goalscoring days were over and he was employed in a midfield role from where he scored just 13 times. In his last couple of seasons at Portsmouth he was also involved with coaching the junior players and during his last season there one of his last games was at Turf Moor and I don't think any Burnley fan there that night will ever forget the welcome he received. The applause started as he emerged from the tunnel at the head of their team and it continued for some considerable time. It was the sort of special reception that is reserved for only the very best, and Pointer was definitely one of the very best. He returned to the north west at the end of his playing days and became Blackpool youth coach under manager Harry Potts, and when Potts returned to Turf Moor he brought Pointer with him during a period when he would have coached the likes of Vince Overson, Brian Laws and Micky Phelan. He also had a period coaching at Bury before leaving the game. Pointer played at Wembley ahead of our Sherpa Van Trophy Final at Wolves, and incredibly he continued to play football regularly on the Fylde in local football until he was well into his fifties. Ray Pointer was one of the stars of the first Burnley team I ever watched. Only George Beel has scored more goals for our club and for 1960s supporters he will always be remembered as one of our greats.